Are you thinking about going anywhere in Manhattan next week? Plan ahead. 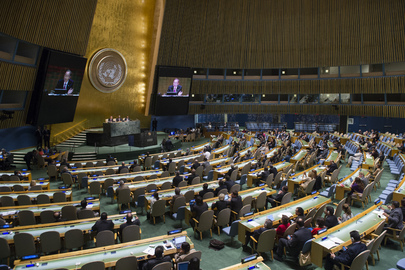 The UN General Assembly and associated meetings are scheduled from September 22nd until September 27th. Hundreds of heads of state, foreign ministers, diplomats and other officials move around the city and snarl traffic. Expect to see a heightened police presence at hotels and other venues around the city. The NYPD and DOT do their best to minimize the intrusion on New Yorker’s lives, but please allow sufficient time for delays in Midtown East. Streets throughout the city will close as motorcades proceed from meeting to meeting…reception to reception. The area around the UN is significantly affected. View a map of the pre-determined street closings here. Thanks to Edie Mesick of UJA-Federation of NY’s Government Relations Department for digesting and distributing information on this opportunity. The latest information can be found immediately below. Scroll down for the information on the grant. Additional information has been posted by NYS OCFS on the Federal SSBG RFP opportunity for funding for certain Superstorm Sandy losses not covered by other resources. Use this link to view the Q&A post. Houses of Worship and Parochial and private schools are eligible to apply for this funding (assuming that the services are provided to a population that was directly impacted by Sandy and that the program meets all other eligibility requirements). Insurance deductibles are eligible for reimbursement under the Sandy SSBG. For sites that were damaged that you rent, the entity responsible for the building would have to be an eligible applicant. Use this link to view the bidder’s conference and access the PowerPoint used during the conference, for more insight that might help you in determining whether to apply for this funding. Hint: In order to be considered for this grant all not-for-profit organizations must be prequalified in the Grants Gateway by the time of contract award. To register go here. NYS has $200,034,600 in federal Superstorm Sandy Social Services Block Grant (Sandy SSBG) funding for eligible health and human services providers. Sandy SSBG resources are dedicated to covering necessary expenses resulting from Superstorm Sandy, including social, health and mental health services for individuals, and for repair, renovation and rebuilding of health care facilities, mental hygiene facilities, child care facilities and other social services facilities. DHS has an excellent resource: the US Computer Emergency Readiness Team (US-CERT). Their website has information ranging from Computer Security 101 to advanced information for IT professionals. Remember: Scams, bots and viruses continue to proliferate. Use caution when opening email messages and take the following preventive measures to protect themselves from phishing scams and malware campaigns. Other great information for non-techies from the US-CERT website. Top 10 Ways to Improve the Security of a New Computer Because our computers have such critical roles in our lives and we trust them with so much personal information, it’s important to improve their security so we can continue to rely on them and keep our information safe. Virus Basics Learn about viruses, what they can do to your systems, and how to avoid them and lessen their impact. Securing Wireless Networks In today’s connected world, almost everyone has at least one Internet-connected devices. With the number of these devices on the rise, it is important to implement a security strategy to minimize their potential for exploitation (see Securing the Internet of Things). Internet-connected devices may be used by nefarious entities to collect personal information, steal identities, compromise financial data, and silently listen to—or watch—users. However, taking a few precautions in the configuration and use of your devices can help prevent this type of activity. Staying Safe on Social Networking Sites The popularity of social networking sites continues to increase. The nature of these sites introduces security risks, so you should take certain precautions. A host of officials turned out this morning in support of the Williamsburg Jewish community to decry the burning of 11 mezuzot there. Williamsburg is a community of faith and the mezuzot affixed outside our doors represent our faith in the spiritual protection divinely promised to our ancestors in Egypt and extended to us throughout the centuries. No vandal, however filled with hate, could ever undermine that. The fact that the vandals chose to strike on Holocaust Remembrance Day is especially horrifying. The physical protection of New York’s Jewish community is safeguarded by the NYPD. The Hate Crimes Task Force joined with the local precinct in order to muster every appropriate resource for the investigation. We have faith that they will apprehend those responsible so that they may face the full weight of our criminal justice system. The Jewish Federations of North America applauds today’s Congressional approval of $10 million in new funding to nonprofits through the Department of Homeland Security’s Nonprofit Security Grant Program (NSGP). The allocation was included within the just-completed Fiscal Year 2013 Continuing Resolution. Though the win was hard fought amid difficult budget discussions, the approved funding will help ensure that a minimum of 127 grants for at-risk nonprofits will be available this year. These federal funds help bolster the security of nonprofit institutions deemed by the Department of Homeland Security to be vulnerable to terrorist attacks, including many Jewish organizations and institutions. Threats to Jewish institutions continue to be a national security concern. Though the Nonprofit Security Grant Program has taken a number of funding hits in recent years, with funding at the $10 million level, the NSGP will be able to remain a program that is impactful, tangible and preventative. Senate Appropriations Chairwoman Barbara A. Mikulski (D-MD) has been the stalwart champion of the NSGP since co-sponsoring the establishment of the program with the late Pennsylvania Senator Arlen Specter. Sen. Mikulski’s efforts are supported by her Senate Appropriations counterpart, Sen. Richard Shelby (R-AL), as well as House Appropriations Chairman Harold Rogers (R-KY) and Ranking Member Nita Lowey (D-NY), and Senate and House Homeland Security Appropriations Subcommittee leaders including: Sen. Mary Landrieu (D-LA), Sen. Dan Coats (R-IN), Rep. Robert Aderholt (R-AL) and Rep. David Price (D-NC), among others. JFNA thanked Congressional leaders and Secretary of Homeland Security Janet Napolitano for their support of this vital program, and expressed gratitude to partners including the Orthodox Union, Agudath Israel, the Jewish Community Relations Councils of New York, Washington, Baltimore and Indianapolis, and Federation communities including New York, Chicago, Philadelphia, Washington, Baltimore, Seattle, Boston and Las Vegas. JFNA works with partners to sustain the program and serves as the leading technical resource to hundreds of Jewish grant applicants annually. JFNA continues to work with Congress to ensure that the NSGP continues in Fiscal Year 2014, and to press the Administration to support continuing and strengthening the NSGP in 2014. Created by Congress in 2005, the Nonprofit Security Grant Program has successfully carried out its mission to support nonprofit organizations that are at increased risk of terrorist threats and integrate nonprofit preparedness activities with broader state and local preparedness efforts. JFNA, along with key communal partners, facilitated the establishment of the program, and spearheaded its own security initiative, the Secure Community Network. Since the program began, Congress has appropriated $138 million toward NSGP, which is distributed within designated high-risk areas across the country to help nonprofits acquire and install physical security enhancements intended to deter and detect terrorists and extremists.